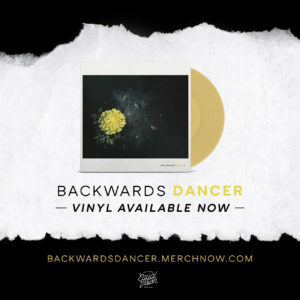 In celebration of the vinyl release of their critically-beloved 2017 self-titled full length, Backwards Dancer have released “October”; a brand new track that will be included on the new vinyl. Already revered for their raw, emotive lyrics and progressive arrangements, “October” is arguably the biggest sounding track the band has released to date. “October” rives with vitriol and dynacism as Zack Shaw’s vocals fight to drive home the song’s point over a wall of distortion and cannon-like percussion. “October” can be streamed now exclusively on Soundcloud, and you can preorder the Self Titled vinyl on Equal Vision Records. Formed in 2014, following Zack Shaw’s departure from The Hotelier (which he co-founded, under the original moniker The Hotel Year), Backwards Dancer has quickly developed their unique style that navigates deep intrapersonal emotion into thoughtfully orchestrated compositions. Their recent self-titled full length explores the concept of dependence, and the human condition in general, in a raw and dynamic way, in the context of relationships, use of substances, money, overall mental health and more. Backwards Dancer are currently supporting Say Anything on their tour celebrating the 10th Anniversary of their seminal double album In Defense of The Genre. Full dates can be found below and you can buy your tickets now through the Say Anything website. Backwards Dancer is Zack Shaw and Andy Underwood. 01/13 – Baltimore, MD @ Rams Head Live!